A cocktail style wedding reception can be comfortable, hip, and super fun. But how do you handle seats for guests, particularly older ones? Read on, my friend, read on. What’s your advice for a non-sit down wedding? I’ve attended two that had food stations for 2 – 3 hours and music the whole time, so it was a little less traditional. I love the idea and my venue will work with me to design it. The problem I’m dealing with is seating. My fiancé and I only want tables for about 50-60% of the people and some extra high top tables to encourage people to stay up and dance. We’d still have seats for older people. But my mom insists on seats for 100% guest list. What are your thoughts? Hey A! First of all, kudos to you for thinking outside the box! Cocktail style receptions are relaxed, modern, and memorable; I personally love the idea of one! I would just set expectations and state that it is a cocktail style reception on your wedding invitation or website. Think of any cocktail reception that you’ve been to – there certainly isn’t enough seating for every single person. 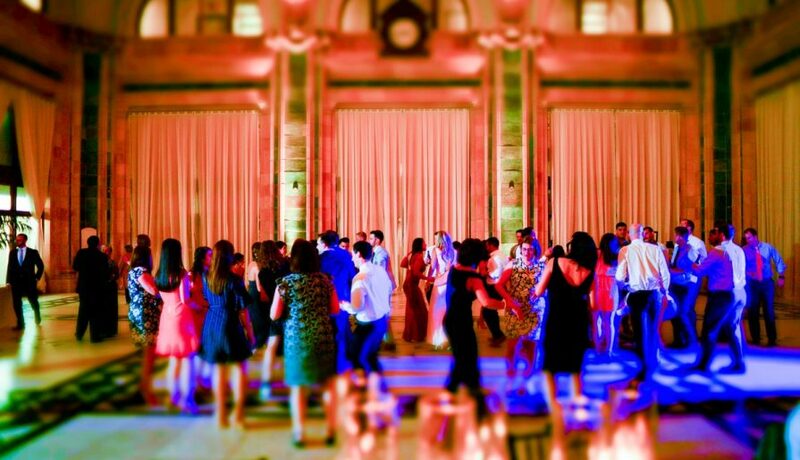 The point of a reception in the true sense of the word is to mingle, mix, and work the room. As long as you provide some seating for elderly guests or those who don’t want to dance, you’ll be golden. I would definitely set up lots of high cocktail tables for leaning, setting drinks on, etc. too! If you want more chairs without more tables, add some extra seating against the wall along the perimeter of the room or set up some amazing vignettes with rented vintage settees or modern lounge furniture. Does anyone have any other ideas? Have you been to a cocktail style wedding reception? Was there seating for everyone? 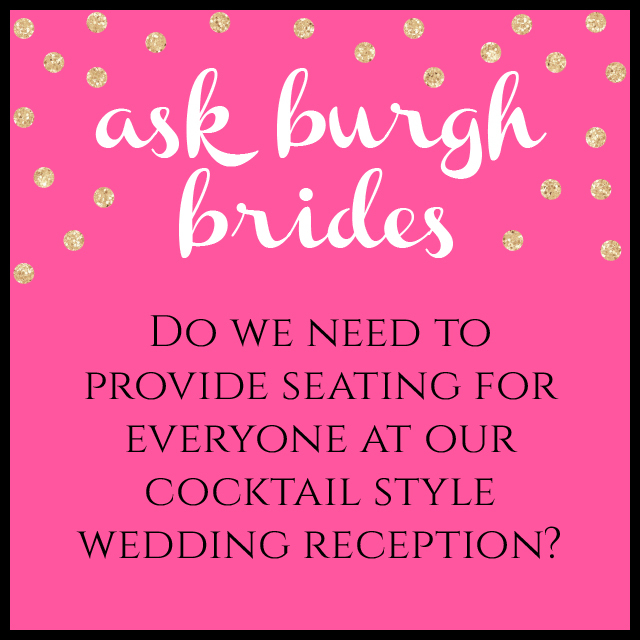 Comment below and help a fellow Burgh Bride out! Planning a wedding and need some help? You’ve come to the right place! Submit your question and you could see it answered right here on the blog. I agree with all you said; you do not need to provide seating for more than 1/4 to 1/3 of your guests (50% max) for a cocktail style reception. We like the idea of putting two bar stools at a highboy cocktail table. Typically, two couples will share that table with the ladies seated and the guys standing. At a cocktail style reception, no one can claim a particular table as theirs for the evening. As long as the reception is less than three hours, I think it is fine to not provide a seat for 100% of your guests; if it goes longer than that, then I think you should consider providing a seat for all guests rather than have them playing musical chairs all night. thanks for that input, Dan! i think it’s a great idea to consider the timing of the event. you’re absolutely right…a mingling cocktail reception for a few hours is great; anything longer than that and people will likely want to sit down. so happy you added that insight!